Higinio V. Gonzales (1842-1921) was more than a gifted metalworker. A man of varied talents whose poems and songs complement his work in punched tin, Gonzales transcends categorization. In this book, Maurice M. Dixon, Jr., who has spent more than thirty years studying New Mexico tinwork, describes the artist’s signature techniques. Recounting the scholarly detective work that revealed the full scope of Gonzales’s art and career, Dixon tells the story of this man who was a craftsman as well as a poet. 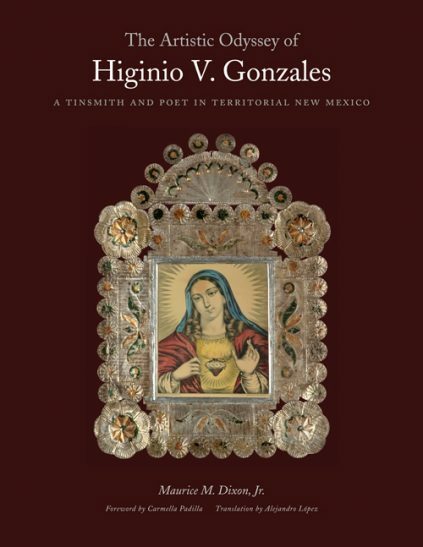 Featuring translations of Gonzales’s poetry, this award-winning book restores a long forgotten New Mexico innovator to the prominence he deserves. Maurice Dixon is an artist and art historian based in Santa Fe whose work is included in the collections of the Museum of Spanish Colonial Art, The National Hispanic Cultural Center, and the New Mexico Museum of Fine Arts, among others, as well as in numerous private collections. He has created works on paper and canvas and is also himself a tinsmith specializing in a variety of decorative architectural commissions for public and private entities. He is co-author, with Lane Coulter, of the highly-regarded New Mexico Tinwork 1840-1940 (University of New Mexico Press). Carmella Padilla is an award-winning journalist and author who writes about intersections in art, culture and history in New Mexico and beyond. She is of several books that examine New Mexico Hispano art and culture, including, with photographer Jack Parsons, Low ‘n Slow: Low Riding in New Mexico, and The Work of Art: Folk Artists in the 21st Century. Alejandro Lopez, who translated Gonzales’s poems from Spanish into English is a Spanish-language translator based in Santa Cruz, New Mexico.